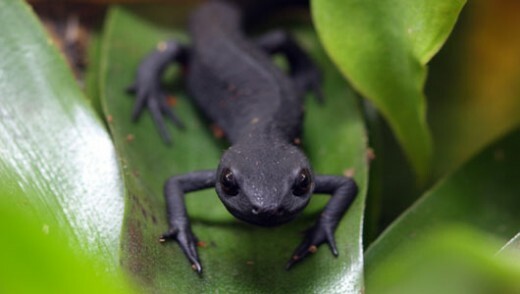 Newts have the ability to regenerate limbs, eyes, spinal cords, hearts, intestines, and upper and lower jaws! The Great Crested Newt, Britain’s largest amphibian, can grow twice as big as other newts – up to 18cm long and live for up to 15 years. The Great Crested Newt is black and warty in appearance with an orange and black spotted underside, with the markings characteristic to each individual. In the mating season he develops a large wavy crest down his back. Male smooth newts have a smaller crest to display to females, whilst palmate males have palmed feet and a whip at the end of the tail. Female newts lay one egg at a time on a specially selected piece of pond plant. She sniffs the leaf to make sure it has the right cellulose amount and then after laying one egg closes the leaf around it with her back legs and glues it shut over the egg. The main predators of young newts and the eggs (and of most other pond life) are fish. Larger predators such as foxes, grass snakes and herons eat the adults. Habitat: Varied. Adult newts have lizard-like bodies and may be either fully aquatic, living permanently in the water, or semi-aquatic, living terrestrially but returning to the water each year to breed. Range: North America, Europe and Asia.